IWASSA Co.: Access Gmail from your mobile device . Access Gmail from your mobile device . The Gmail app for Android and iOS facilitates access to e-mail Google through mobile devices. The application supports multiple accounts, updates and notifications in real time searches in your inbox and more. Download now Gmail on your phone and access your email in just one click. The application supports up to five alternate accounts as alternatives receive notifications of new posts, and view the picture of who is receiving the email listing. In addition, its integration with Google Calendar allows the user to answer a call on your calendar; access and send attachments; and others. 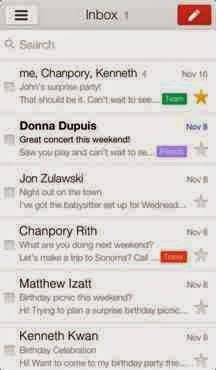 In graphic terms, the Gmail interface is totally what you expect from a Google application. Service users will use it without any problem. The way you access your other accounts is simple: just drag the screen from left to right and click on the image that refers to what you want. The application provides valuable resources, especially for those who need to work while on the road. Among them are the: auto complete contacts that fills the rest of the email of the person, and search with predictions as you type it will show the options below. Another feature of Gmail is the ability to organize your messages by archiving those that are not so important; scoring the tagged specific issues; putting in major star and others. The Gmail application lets you keep an eye on your place where you are quickly and easily email box. Download it without paying anything, right now!